hacker attacks, hacks, viruses, and user data leakage. We check all files and Magento settings for vulnerabilities using our unique software. All CMS settings and server settings are checked by our engineers, and in case of detection of errors and vulnerabilities, we eliminate them and install additional security extensions. After thoroughly checking your CMS, we close all backdoors and vulnerability. We make a full backup of the system and install the Magento security extensions developed by us, which will make breaking into your online store impossible. We do not just update your Magento CMS and Magento extensions, we install software that protects not only CMS but the entire server from all possible hacker attacks. 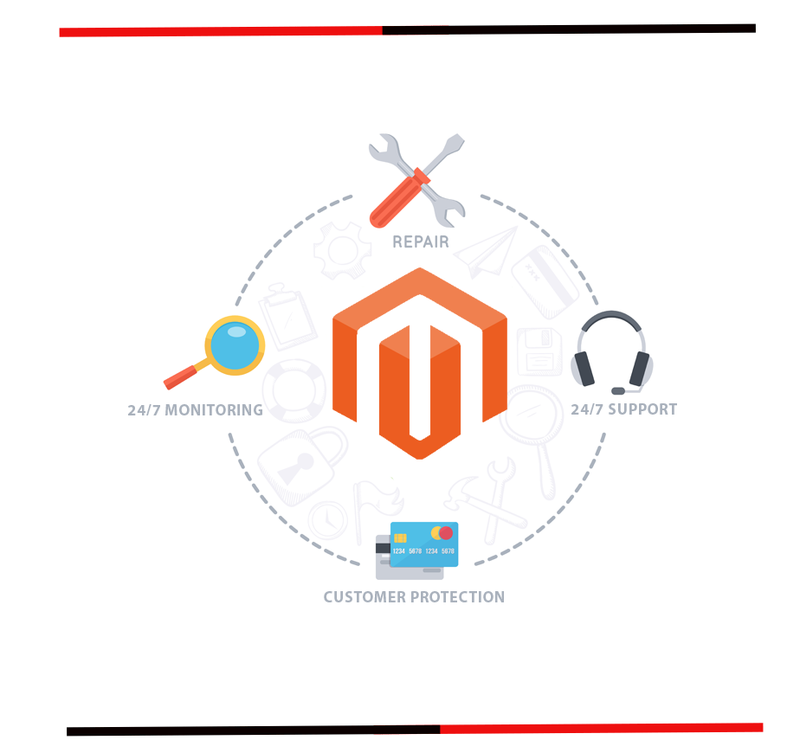 We install Magento & Magento 2 Antivirus & vulnerability scanner on your website, which performs daily scans & checks of CMS core files for changes and modifications. We monitor all changes in the core files of Magento CMS and in case of suspicious activity or changes, our engineers look through the files and eliminate the changes. We developed Magento Firewall, which closes all possible vulnerabilities of the CMS itself and protects the site from various types of attacks: SQL, XSS, BruteForce, etc. At your request, we will transfer your sites to our secure servers to ensure complete protection not only of Magento CMS but also of the server where your sites are located. Daily security scan will help us detect all possible changes on your site and in case of detection of a new vulnerability, quickly eliminate it and protect the site from hacking. For each site, we run daily backups and save files and databases on our servers so that in the event of a hacker attack your store continues to work without interruption. Why is Magento Security so Important? which means it will always be the number one target for hacker attacks and viruses. 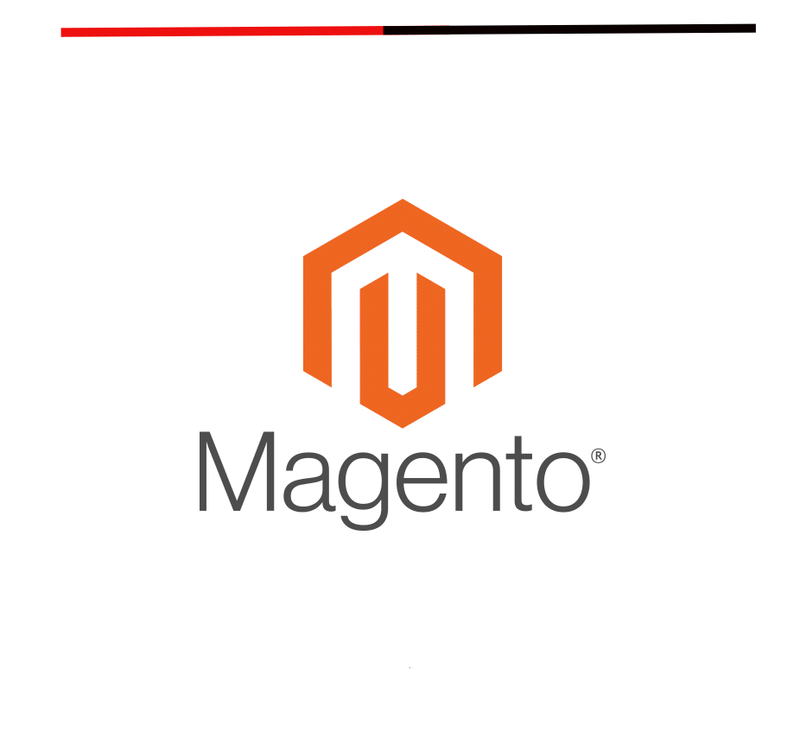 Magento and Magento 2 are some of the most popular CMS for creating an online store, which means they will always attract hackers. If you use CMS data for your store, then most likely you will have to face hacker and virus attacks. It is hacking e-commerce sites that hackers get a huge amount of user data from, which they can then use for their own purposes. The biggest problem for store owners is that by allowing your site to be hacked once, you can lose the trust of your customers forever and with trust, you will lose the customers, and hence sales and income. The biggest problem is that you use third-party extensions, which means that in any module there may be a vulnerability, which hackers will use to hack your site. Also, you should keep in mind that the servers on which your store is hosted may not be safe enough, for example, if the hosting provider did not install a firewall or antivirus on your server. Thus, no matter how reliable and secure a CMS is, there is always a risk of hacking and leakage of data about your customers. Each CMS needs an extra layer of security, and Magento is no exception because it’s better to prevent hacking than to lose the trust of your customers and search engines. Customer confidence in your store plays a very important role in sales. There have been cases in world practice when entire shops and businesses were forced to close due to hacking and leakage of data about their customers. In addition to fines and lawsuits, you risk losing the trust of your customers once and for all, because very few people will risk making a purchase in a store where their personal data and credit card information are not protected and can be used against the buyer. If you closely follow the news about hacker attacks on various CMS, then you know for sure that Magento and Magento 2 regularly reveal vulnerabilities through which hackers get access to online stores, and sometimes access to personal data of customers of stores. If you neglect the protection of your store, then you are very much at risk of facing problems such as hacking and loss of customer confidence. Magento CMS protection is not something that you should be saving on, because there is no code that could not be hacked! Google scans sites for malicious code daily. If the search engines notice that there is a virus on your website, then their task is to prevent users from accessing your resource, because the virus can break into their computers and thus lead to serious consequences for your visitors. As soon as the search engines suspect that your site has been hacked, you immediately get into the blacklist, which means you lose up to 99% of the traffic, and therefore sales. To protect yourself and your positions in search engines and not to lose sales from search traffic, you need to pay special attention to protecting your CMS, because after getting sanctioned by search engines, restoring positions to Google can take from several weeks to several years, depending on the Google robot’s speed. And even if Google’s confidence is restored, it’s often impossible to restore customer confidence. Often, hackers hack shops to install their SPAM scripts on the site. SPAM can be divided into two categories: search engine spam and email spam. Both types of spam can lead to very bad consequences for the site owner. Email SPAM will completely undermine the trust of customers to your store and add the address of your site to all SPAM databases, and the search engine spam will block your store in search engines, and therefore completely stop selling your products through search engines. From our practice, we can say that the built-in modules of Magento and Magento 2 are not able to withstand certain types of hacker attacks, which means the use of additional measures such as Magento Firewall and Magento Antivirus is a necessary measure for every site owner.